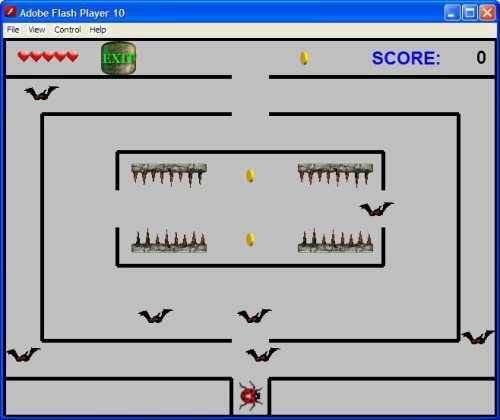 Description The main object of this game is to escape the maze alive. Not counting the in game tutorial there are a total of 15 levels to escape from and each level presents it's share of dangers. In addition to avoiding spikes and bats there is also gold to be collected for points and speed ups (to make you go faster) as well as slow downs (to make you go slower). You can also earn extra lives to give you a better chance of completing the game. When you reach the end of the game (or run out of lives) you will be given the opportunity to enter your high score to compare it with others. Good luck and enjoy the game. Controls Use the arrow keys for movement.